What is GERD (acid reflux)? Heartburn, the burning sensation in the middle of the chest that is usually triggered after eating, is actually the most common symptom of a more complex disorder called GERD (Gastroesophageal reflux disease) or acid reflux - a condition where the stomach refluxes or backs up its liquid content to the esophagus. Since the stomach contains acid, in addition to bile and several digestive enzymes such as pepsin, the liquid returned to the esophagus comes into direct contact with the lining of the esophagus, causing agitation and a burning sensation. If the body cannot prevent the acidic mixture from backing up into the esophagus, in time it can seriously damage the esophagus and lead to dangerous complications. The esophagus is a muscular tube in which food is transported using muscular contractions from the mouth to the stomach. Normally, the lower esophageal sphincter (LES), located at the bottom of the esophagus, serves as a one-way valve that opens automatically to allow food to enter the stomach and closes automatically to prevent the acidic content of the stomach to reflux into the esophagus. However, when the LES "relaxes," is weak or loose and doesn't operate accordingly and in appropriate times (e.g., stays open when it needs to be closed), the content of the stomach flows back into the esophagus. ·The natural ability of the esophagus muscles to cleanse the bottom of the esophagus. It's interesting to note that with most individuals who suffer from acid reflux , the concentration of acid within the stomach's content liquid is much higher than with people who don't experience reflux. 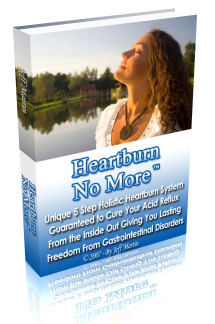 Moreover, it has been found that among heartburn sufferers, the acidic liquid of the stomach comes into contact with the lining of the esophagus and stays there longer than it does among non-reflux sufferers. To protect itself from prolonged damage to the esophagus, the body uses the effect of the saliva, which contains water, electrolytes, enzymes and mucus to neutralize the damage to the esophagus inflicted by the acid reflux . Moreover, during waking hours when the body is in an upright position, the force of gravity pushes the liquids back into the stomach. However, at night as the body produces less saliva, the lack of swallowing due to the body's position and as gravity works against us, the reflux liquids stay longer in the esophagus, increasing the damage and injury to the lining of the esophagus. G.E.R.D is a complex condition triggered by many factors. This is one of the reasons why physicians still find this debilitating condition so hard to eliminate using OTC and prescription drugs. Luckily, there is an alternative treatment of GERD - the holistic way that tackles the problem from the root and restores the inner natural intestinal and esophageal environment into balance. What REALLY Causes Heartburn? Discover the surprising TRUTH is this article.